When you visit the beach in a marked snowy plover breeding area, stay in the wet sand. The beach has four distinct areas – the dunes, dry sand, wrack line, and the wet sand. The wrack line is where all the seaweed and debris wash up onto the sand, and follows the high tide line. If you are on the ocean side of the wrack line, then you are on the wet sand! Walking in wet sand is usually easier than in the dry sand, so this is a win-win for people and plovers. Walking and riding horses in the wet sand adjacent to shorebird conservation areas helps snowy plovers hatch their nests. Plovers make their nests in the dry sand – not in vegetation. This is one of their adaptations that makes them so unique among Oregon’s birds. They are one of a handful of birds to nest directly on the beach, along with Capsian terns. 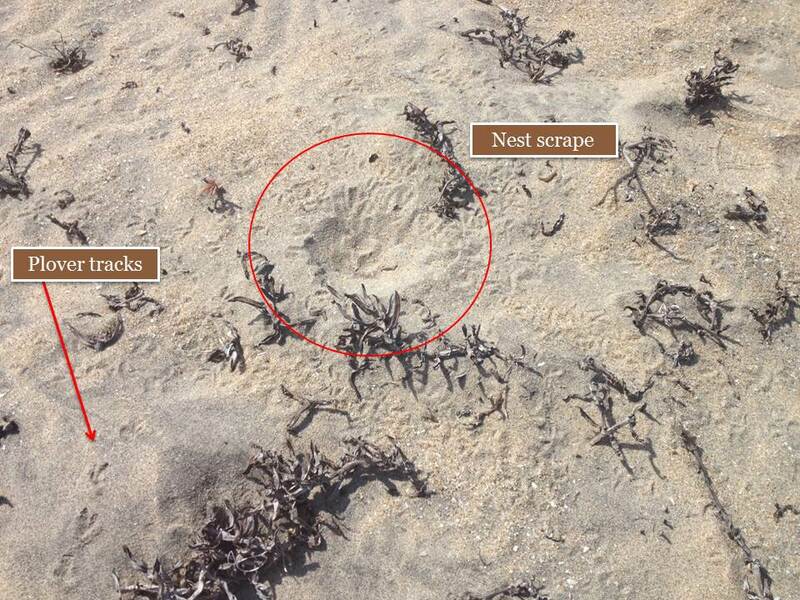 These nests are very hard to see, and can easily be trampled or run over without you knowing it! Nesting birds are also sensitive to disturbance – they often perceive you as a threat, and if you get too close they leave their nest to protect themselves and the nest. When this happens many times a day the eggs won’t get enough warmth, predators are more likely to find the nest, and the parents might just give up due to the stress. 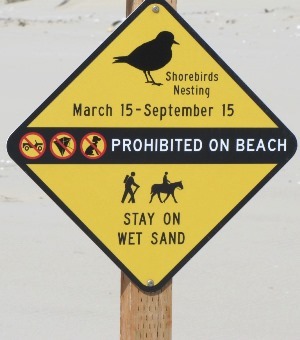 So please let them nest in peace, and stay on the wet sand! There are other ways to help as well. As much fun as it is to let your dog run free along the beach, chasing shorebirds into flight, keep in mind that it is very hard on the birds to constantly be jumping into the air and flying down the beach. This is especially true for shorebirds that are migrating or nesting (like plovers). Please take your dog to beaches outside of the special shorebird conservation areas. With 230 miles of beach there is a lot of places for pups to play! Moving vehicles and flying kites are also sources of danger for nesting plovers (real and perceived), and these activities are also best done outside of shorebird conservation areas. Watch for these signs to know if you are in a shorebird conservation area. There are numerous volunteer opportunities in both Oregon and Washington! Some opportunities are called docents – people that educate beach visitors about western snowy plovers and how to recreate alongside them. Other opportunities are for surveys. OPRD has Plover Patrol team for the north coast that surveys for plovers at our four shorebird conservation areas so that we can protect their nests if they return to breed. Links to volunteer opportunities are in the drop down menu on the navigation bar.